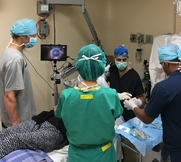 In June of 2017, California eye surgeon Dr. Jeff Rutgard, one of the founders and President of iSight Missions, traveled with his team of volunteers to Tecate, Mexico to restore vision to impoverished blind adults and children using the Epic Portable Microscope purchased with a recent grant from Miraglo Foundation. According to The World Health Organization, 285 million people are visually impaired worldwide, and 90 percent of visually impaired persons live in developing countries. Dr. Rutgard and his team of iSight volunteers are restoring eyesight and transforming the lives of the under-served in impoverished locations around the world. By operating on those poor and blind, training doctors in the U.S. to have the skills to volunteer and join him on eye mission projects, and training doctors and nurses in developing countries, he and his team are impacting tens of thousands of lives. Unoperated cataracts are an important cause of low vision and the leading cause of blindness, which can be cured by a 30-minute surgery. The Epic Portable Microscope allows Dr. Rutgard, an expert in the MSICS technique (Manual Small Incision Cataract Surgery), to perform this life-transforming eye surgery. It also allows him to teach other doctors his technique during surgery, as they can observe each of his micro-steps with the portable monitor that is integrated into the microscope. This technique is not taught in U.S. eye surgery training programs. It is, however, the key surgical procedure that equips ophthalmologists to volunteer for humanitarian eye surgery missions to developing countries where the cataracts are routinely rock hard and unable to be removed with conventional methods. Adults with restored eyesight can return to work and provide for their families, breaking the cycle of poverty. Children with restored eyesight can go to school and see a brighter future.